This textbook can be used to teach electromagnetism to a wide range of undergraduate science majors in physics, electrical engineering or materials science. By making lesser demands on mathematical knowledge than typical texts, and by emphasizing electromagnetic properties of materials and their applications, this text is particularly appropriate for students of materials science. Many competing books focus on the study of propagation waves either in the microwave or optical domain, whereas Basic Electromagnetism and Materials covers the entire electromagnetic domain and the physical response of materials to these waves. 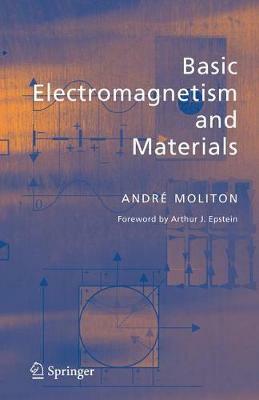 From the Foreword: Andre Moliton has written a very clear account of electromagnetic radiation generation, and its propagation in free space and various dielectric and conducting media of limited and also infinite dimensions . . . I recommend this book for those interested in the field of electromagnetic radiation and its interaction with matter. The presentation of mathematical derivations combined with comments, figures, descriptions, problems, and solutions results in a refreshing approach to a difficult subject. Both students and researchers will find this book useful and enlightening.